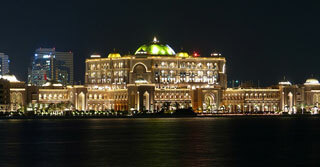 The Emirates Palace is a luxury hotel in Abu Dhabi. It was created with the aim of showcasing Arabian culture. It offers luxury hospitality. It is located on 1.3 km of private beach. 85 hectares of lawns and gardens surround the hotel, as well 114 domes that are 80 meters high. It contains 394 residences. The Corniche runs from here all the way north. This article uses material from the Wikipedia article "Emirates Palace", which is released under the Creative Commons Attribution-Share-Alike 3.0 License.